Focaccia is a restaurant that’s close to my heart for a couple of reasons. It did put a smile on my face when I got to know that I’ll be checking them out for the Restaurant Week India. Click here to read my review on Focaccia when I tried it two years back. Restaurant Week India – What is it? Cellar Door Hospitality Pvt. Ltd. has been organising culinary events across India since their first Restaurant Week event in Mumbai in September 2010. Their flagship event, Restaurant Week is a celebration of the finest culinary experiences in India. They offer the opportunity to dine at each city’s finest formal dining restaurants through a three-course prix fixe menu at a fraction of the price it would normally cost. Restaurant Week runs typically in March/ April and September simultaneously across Bangalore, Chennai, Delhi, Kolkata and Mumbai. The 10-day event showcases over 100 restaurants across the five cities, offering diners a chance to experience some of the finest restaurants; an ice-breaker of sorts. This allows participating restaurants to showcase their food by selecting dishes representative of their philosophy and diners get to experience restaurants they may have hesitated from trying. More importantly, however, it is a celebration of some of the best restaurants our country has to offer and a time for us to be proud of our culinary landscape. If you have any queries, please contact them at [email protected]. As far as Chennai is concerned, the following are the restaurants that are a part of RWI. Also find the links for reviews from fellow foodie buddies who tried the place for the RWI. Located at the heart of the city, Focaccia is a passage to Southern Italy to taste the finest and most authentic dishes. This trattoria styled restaurant offers patrons flavors which arise from the belt of Campania, Puglia, Calabria and Sicily. The open kitchen, the wine rack and wood fired oven, instead of screaming, whispers its connection to the cuisine. Hyatt Regency is located in the ever busy Anna Salai, probably the most important arterial road of this beautiful city. Rubbing shoulders with its boring Siamese twin building, Ramee mall, Hyatt Regency stands majestically as one of the tallest structures in Teynampet. Focaccia is located on the first floor, right next to 365 A.S. Being a star hotel, obviously there is valet parking service. The first thing one would notice when walking in would be the wall/rack that’s loaded with wine bottles. The pair of eyes will next feast on the open kitchen with its stone oven. This restaurant ticks all the right points when it comes to ambience. Posh furniture, large glass walls and classy looking décor, the place is fine dining experience’s best example. 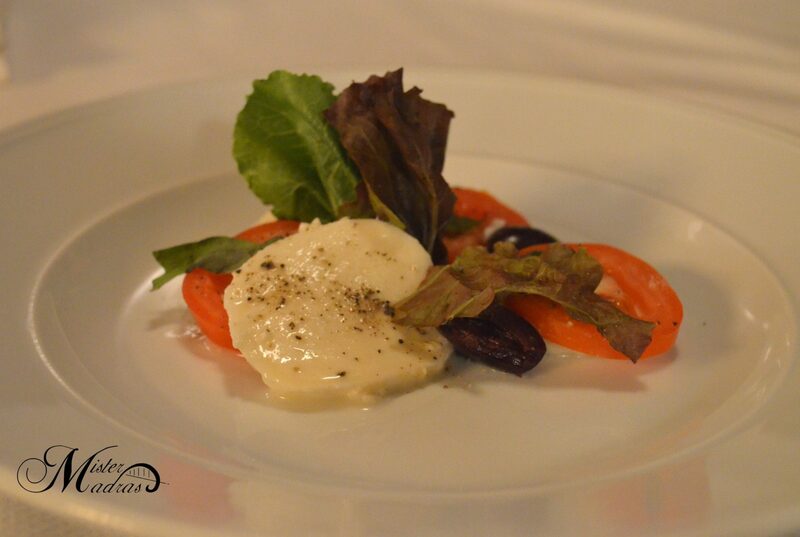 Insalata Caprese – Fresh salad with greens, tomatoes, picked olives, oregano, bocconcini (A variant of mozzarella cheese) and a drizzle of olive oil. This simple but elegant salad has freshness written over every single bite. This is a vegetarian’s salad dream come true. Fritto Misto – If the above mentioned item is a vegetarian’s dream appetiser, this one is for the non veggies because nothing can be better than some seafood medley. 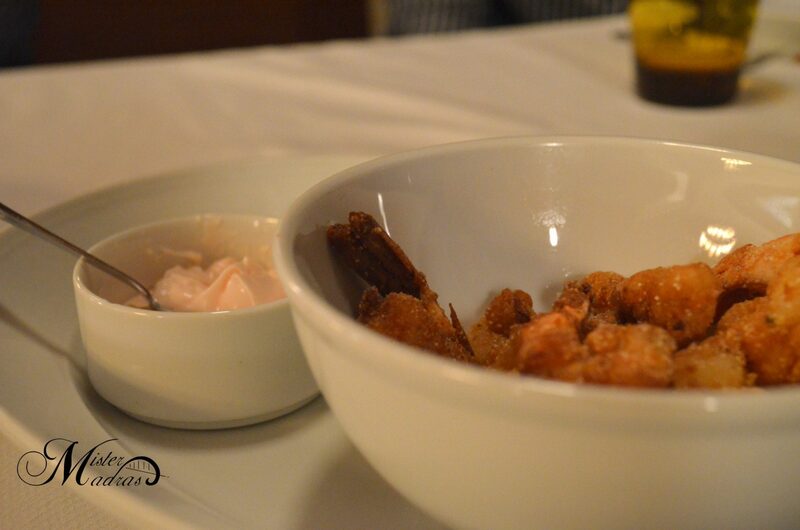 This dish consisted of deep fried fish, prawn and squid with a mild saffron dip. The crumbly fried seafood went sublimely well with the subtle dip. 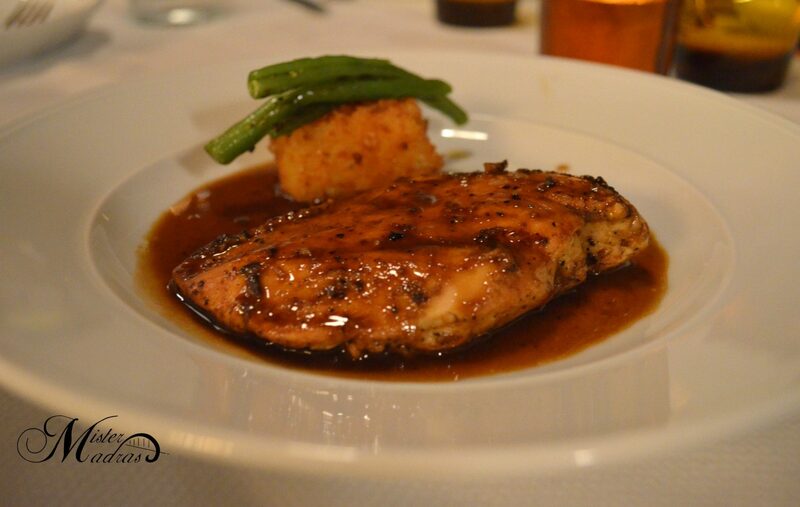 Pollo Arrosto – This exemplar Italian dish consists of roasted chicken, potato and beans in a gravy that’s made from herbs. Sans the quantity of the gravy, the succulent chicken and mushy potatoes did the trick gracefully. 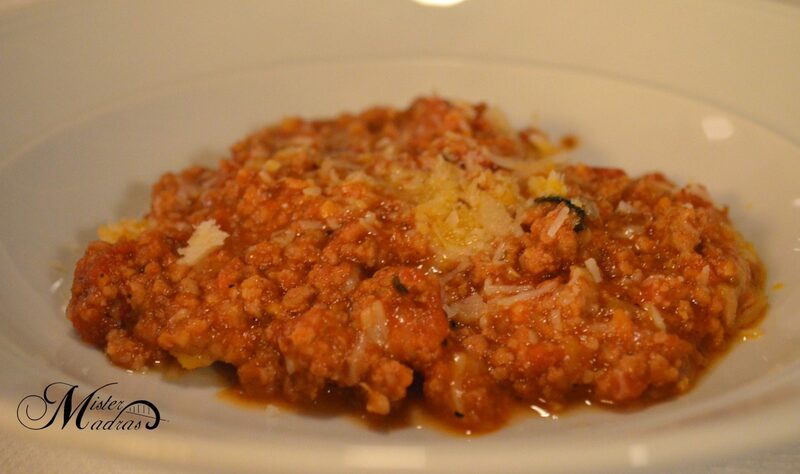 Ravioli Di Angelo – What’s better than meat inside a pasta? The answer is, even more meat outside. That’s what this classical dish is all about. Lamb ravioli with lamb ragout and cream, this dish would definitely put a smile on any non veg lover’s face. Loved it. Cassata with Sherry Compote – In-store made cassata with sherry compote and a caramel disc. 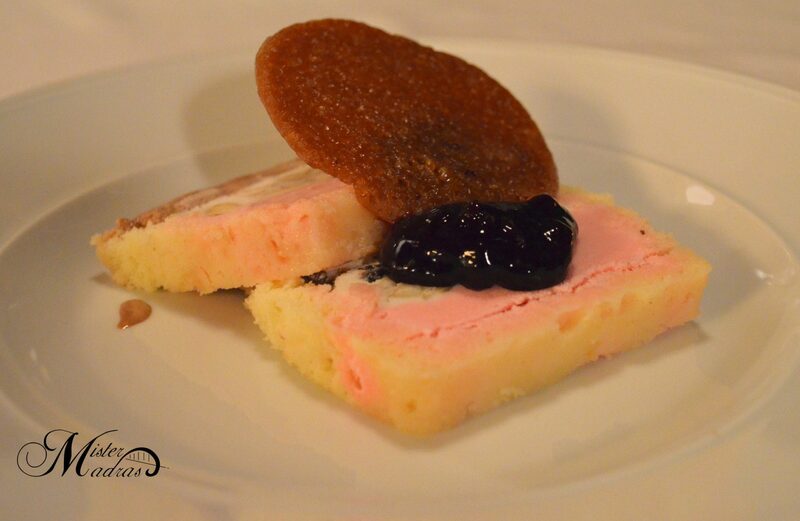 The soft cassata slice complemented the crunchy and chewy caramel disc along with the burst of sweetness thanks to the sherry compote. Chocolate Salami – When I saw it on the menu, I wondered what a chocolate salami could be. The reply to it is pretty simple. 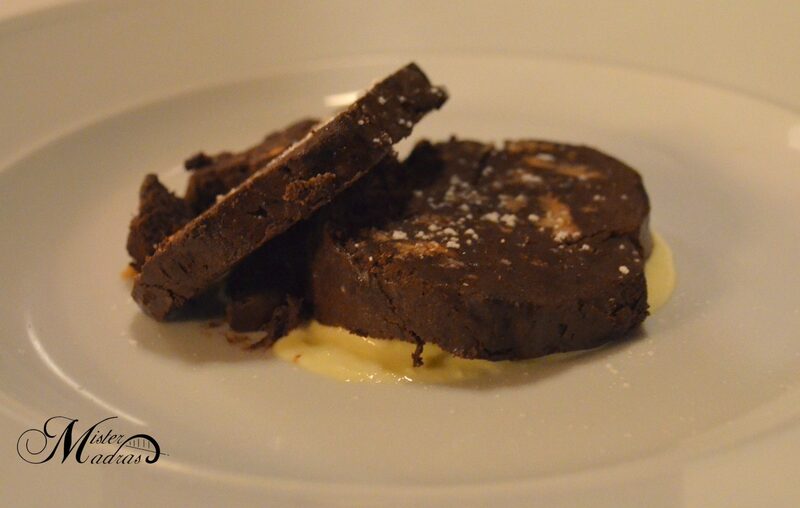 Soft and crumbly chocolate, made into the shape of thick salami slices, served on a bed of cream. The melt-in-mouth consistency along with the perfect level of sweetness makes this dessert a must try. The idea of this event is to have subsidised pricing to encourage more people to try such hotels. The menu’s price is fixed at Rs. 750 for lunch and Rs. 900 for dinner per diner. There’s also the feature of Restaurant Week Signature options over and above an extensive hand-picked menu, giving diners the option of experiencing the restaurant’s signature dish at an incremental cost in lieu of a regular appetiser or main course option. Restaurant Week Signature Appetisers are priced at an additional Rs. 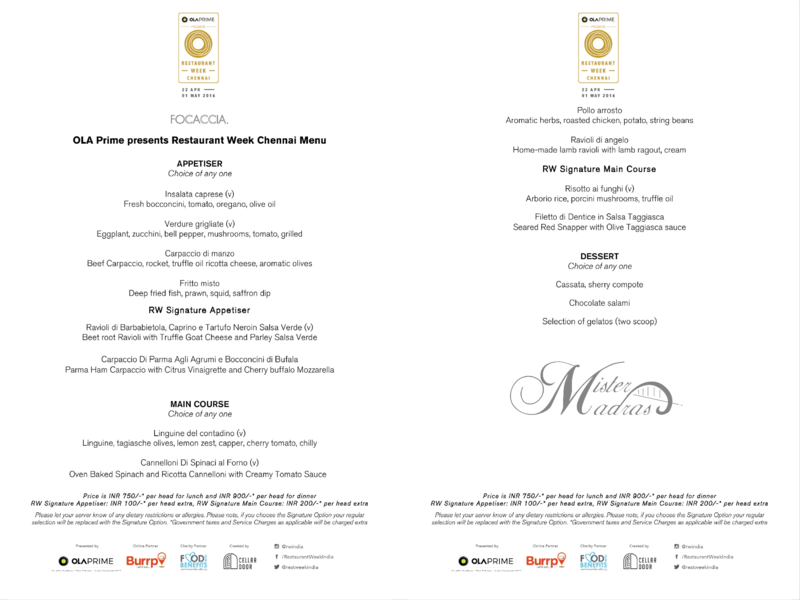 100 and Restaurant Week Signature Main Courses at an additional Rs. 200, excluding all taxes and service charges, at select participating restaurants. Overall, it was a wonderful experience to try a restaurant that I haven’t had the option of trying as often as I would love to. Service was top notch and the meal was spectacular. The Restaurant Week is probably the best time to check out those places you’ve always wanted to visit. So what are you waiting for? Book your tables now! Click here for the list of restaurants, menu and for booking. Pingback: Lotus Thai – The Park, Nungambakkam – RWI | Chronicles of a confused mind.